The Lord Speaks Concerning the Law of Faith. I remember looking at a young boy with dark brown hair. He looked probably somewhere between the ages of eight to ten years old. He looked like the young boy who played in the movie “Chucky” (Alex Vincent). I saw him sitting in what looked and felt like a doctor’s office room with an older man, who looked to be a doctor. There was someone else in the room with them. It seemed like the doctor was questioning the boy about this person. As I remember, the boy could see when the person was acting differently and knew when a demonic spirit left or entered back into this person who the doctor was asking him about. I heard the boy say that he could see when the spirit(s) left and when the spirit(s) came back into him. 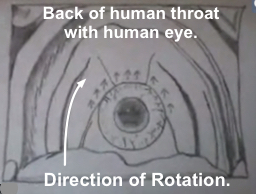 I was then shown in the spirit realm when this took place, and what it looked like. I saw that they entered through the person’s mouth. 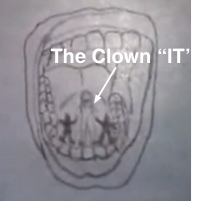 I saw the clown “IT,” which looked to be about an inch and a half tall standing with two shorter dark figures on either side of him; one on the left side and one on the right side. They all were holding hands, forming a line in front of the entrance of the mouth as if they were all in agreement walking through the entrance of the mouth. The entrance to the mouth they were about to walk into was illuminated very brightly with bright light coming out of it. After this I saw that the boy knew they had entered in and I saw one little dark spot, which I knew was alive, on the left side of this individuals mouth. Then it was sucked in like they had all been fully swallowed down into the person. Then I was shown in the back of the person’s mouth a white solid object spinning very quickly. I didn’t know what this object was at first, but realized it was an eye once it slowed down enough for me to see the pupil. Then the boy knew they were all the way in again, and told the doctor what he knew was happening. This triggered something; where the person was sitting that had all this happen to them in the room beside the doctor was now the doll “Chucky” that leaped forward to try and attack the young boy. The doll had a knife in its hand that he was going to use to try and kill the boy. I then saw a wall between where the boy was and the doll. Chucky hit the wall very hard, so hard the impression of Chucky was made in the wall by the force from hitting it. The wall looked to be made of a silver metal type of material. I knew this wall was strong as well. I knew Chucky was stuck within the wall impression from the force of hitting the wall. I can’t remember if Chucky was able to break free from the wall or not and continue after the boy…. As I finished typing the dream, the Lord spoke to me and said, “You speak on what you see. The enemy works off this. Faith does not operate this way. You speak on what you do not see. This is the law of faith. Do not let the enemy use your mouth to speak on what you see. Rather, believe and speak on what the Spirit shows you. This is where your peace lies. Do not allow the enemy to bring those things to life that are not real. Do not allow the enemy to operate against the law of faith; nor contort it. Understand, understand, understand My son. You must grasp the things I am telling you…. NOTE: (Contort means to twist or bend out of its normal shape…. The enemy can contort the law of faith. Faith, hope, and love, but the greatest is love. The enemy can and will contort all three of these, especially the love side of things. One of the things the enemy uses is fear, which the word literally stands for F-false E-evidence A-appearing R-real. The enemy makes things that are not real come to life by fear. Thought: Inter-dimensional demonic spirits are real. They all still operate off denial to lead the masses away from what is good and true by things that appear real through fear; to lead them into that certain denial and acceptance of falsehoods. We are new creatures in the Lord, even as I was shown in the Man-child dream where I took that translucent pill. I was told I would never be the same again and that I could never go back. I would not be the same Kyle in the earth anymore. This deals with the anointing and the Lord’s purposes for being the first-fruit of His Man-child in the earth, just as with you concerning the Bride. We must stand on these truths because that is what is real! Just as the Lord spoke to me above when the Lord said, "Believe and speak on what the Spirit shows you. This is where your peace lies…." (spiritually speaking) to accept and swallow accusations against them that are not real, so mankind will unwittingly accept false accusation for the things that are not real to come to life. Acceptance leads to the fruit of acting upon, which then becomes a part of your reality. Accusation and denial go hand in hand, operating against the truth and those things that are real through faith. The enemy wants to contort faith to dismantle the true operation of this law which, without it, is impossible to please God. The enemy uses what we speak with our mouth and what we see with our eyes to walk by sight, and not by the law of faith. What we walk by is what we agree with, right or wrong. What we see with our eyes is what we speak by. We are to speak and walk by what the Spirit of God is showing us, and not by what our physical circumstances look like. We know something has happened when our peace is taken from us. This is when infiltration of something has taken place. When this happens we have ceased from walking by faith and have started walking by sight. L- The enemy makes things that are not real come to life. Do not allow the enemy to plant thoughts. HP- Do not slack on recording your dreams. Get down what you remember. HH- was silent for awhile….your silence has done much. Arise…. I was looking at a tractor that had earth moving devices on the front and on the back. I focused on the piece of equipment mounted on the back and I saw it could level the land. It had the ability to cut off high places, move dirt, and to smooth land out. The message was, “Now the playing field is level.” I knew it had to do with Kyle’s writing, that it is the battle field where we fight the enemy. The battle field had been leveled through the information given by the Lord!